Waterproof Meter measures pH and conductivity. Equipped with non-glass pH probe and solid-state conductivity electrode, NEMA 4X-rated Model IQ170 measures pH, mV, temperature, ORP, conductivity, TDS, and salinity. It includes LCD display with LED backlight, automatic temperature compensation, automatic pH buffer recognition, automatic conductivity cell constant recognition with auto-ranging, and up to 3-point pH calibration. 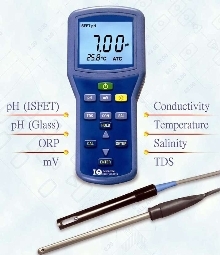 Stainless steel pH probe includes sensor that is virtually unbreakable. The IQ170 is a dual technology pH meter -- non-glass or glass -- with multi-parameter capabilities. This rugged meter system is NEMA4x (IP 67) rated, showcases an extra large LCD display with LED backlight, and has the ability to measure accurately pH, mV, Temperature, ORP, Conductivity, TDS and Salinity. Features include automatic temperature compensation, automatic pH buffer recognition, automatic conductivity cell constant recognition with auto ranging, and up to three-point pH calibration (five-point conductivity - one point per range). The stainless steel pH probe has a virtually unbreakable sensor that eliminates the frustrations of delicate glass electrodes. Complete with both a non-glass pH probe and solid-state conductivity electrode, this ultra-rugged meter system is engineered to withstand harsh use in the most difficult of applications.